Has it really been that long since I blogged last? Really? Wow… Time flies… And I don’t even have a job to blame yet, I’ve just been busy! Right. Time to show you the result of my latest creativity. First, a LO for Magistical Memories – using my new sewing machine! 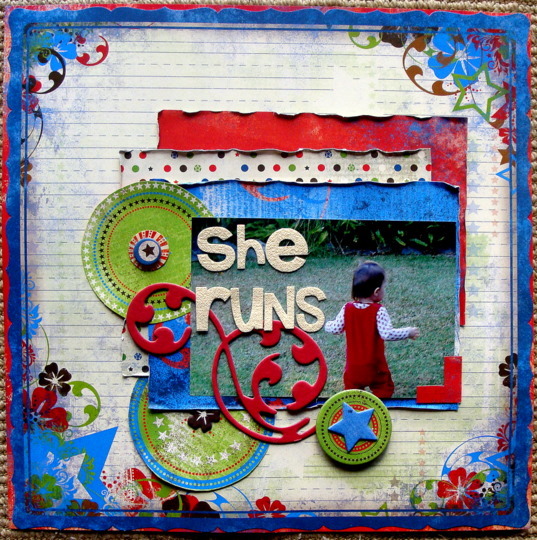 Products used: Bazzill kraft cs, Glitz papers, Prima flowers, Martha Stewart butterfly punch, BG doilie ribbon & buttons, baker’s twine, Webster’s alphas, inkadinkado letter stamps, & nesting circles from Magistical Memories. Are you a fan of Magistical Memories on Facebook yet? Make sure you are, there will be a lot of happenings there very, very soon, and you don’t want to miss that! Products used: Bo Bunny papers & embellies, Prima alphas. 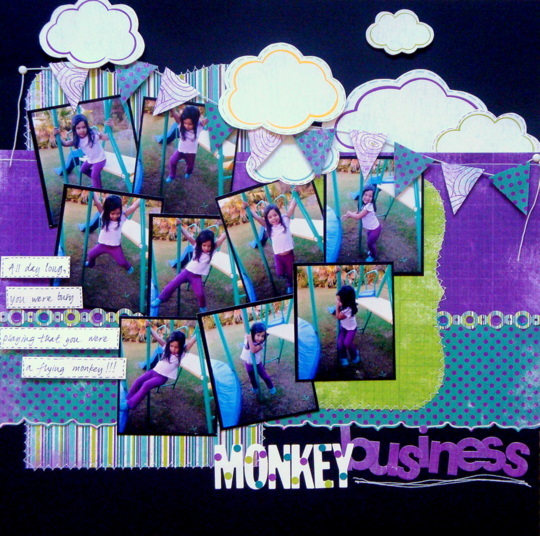 Products used: Bazzill cs, Bo Bunny papers, alphas & embellies, BG alphas, and again I have used a sewing machine. Thanks for stopping by today. I will be back in a couple of days with the RAK winner, and some more creative stuff to share! Changes are afoot… and a RAK! My life is changing. I’ve started looking for a full time job, and went on my first interview today. After being home for about 4 years (with a few months break, working in the Scrapbooker’s Delight shop in Auckland) I am going to be seeing my girls WAY LESS in the future. That is if someone hires me of course, but the chances seems pretty good. This probably means a little less time for my crafty projects as well, but we’ll see. Who needs sleep, I mean really? So, to celebrate these changes (because change is good, right?) I have come up with another RAK. Of course I am un-organised, and I don’t have a pic of the goodies that I’m going to send somewhere in the world… But it’s going to be some stuff from some of my fav MF’s at the moment, so pretty good I think! To win this RAK, I’d like you to tell me yours or your family’s favourite every day meal. I don’t need you to write down recipes (unless you want to), I just need some inspiration to try some different stuff for my family. And I will possibly have to start cooking my hours away in the weekend, to fill the freezer . Because if I am lucky enough to get a full time job, dinner MUST be easy to sort! Please leave a comment IN THIS POST before midnight 31st July to be in to win. I will send worldwide! OK, enough rambling from me, how about some LO’s? 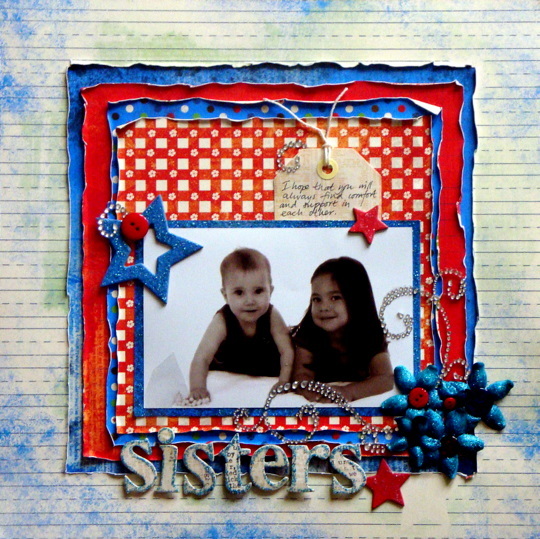 Products used: Kaisercraft papers & embellies, BG buttons, Cosmo Cricket & Webster’s alphas. 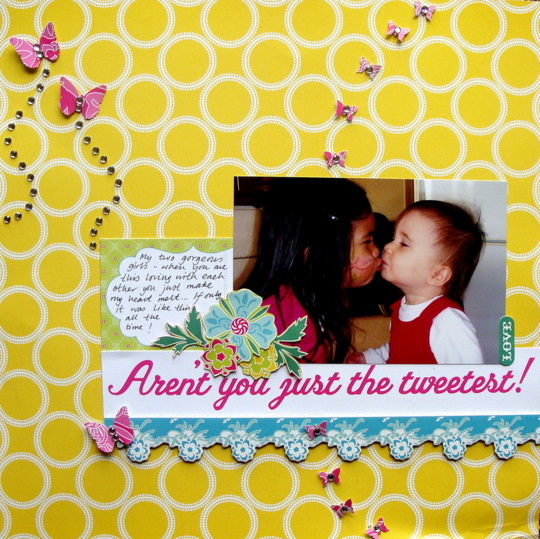 Products used: BoBunny papers & embellies, BG buttons, Webster’s & Prima alphas, and a little bit of sewing too! Again, I’ve used BoBunny papers & embellies, Prima bling, AC thickers, Rose Moka mini alphas, & a gorgeous butterfly from Magistical Memories that I have painted with Tim Holtz crackle paint & I also put some distress ink on too. OK, get your dinner tips in, and I’ll see you soon again! First a LO that I did for Scrappin’ Patch using the Vintage Valentine line from Fancy Pants. I got another one of our wedding photos scrapped, these papers are just PERFECT for such photos! If you don’t know what a hongi is, please ask! Other products used: Bazzzill heart shaped cs, Prima rose ribbon, alphas & leaves, Martha Stewart dioly lace punch & butterfly punch. The Dusty Attic chipboard inked with Tim Holtz distress ink, misc key, BG & GCD alphas. Speaking of Scrappin’ Patch ; go over here and check out how I did a 5 page LO about Elsa’s first birthday using cardstock, Echo Park papers & stickers, & refill pockets from We R Memorykeepers!! And – while you’re there – sign up for our latest NINE WEEK competition! We are testing different styles of scrapping, inspired by some STAR scrappers. Every star will judge their week, and in the end, the total winner will win a Cricut! How frekkin’ cool is that! There will also be weekly prizes and spot prizes throughout the competition – too fun to miss!!! The first star is already revealed, but you still have time to join in if you haven’t already! Products used: Jillibean Soup papers, border stickers, alphas & journaling sprout, baker’s twine, Martha Stewart border punch, misc buttons & brads. And lastly – please go over to the A Million Little Things blog… I’m very honoured to say I’ve got a LO featured there, but there are also loads of inspiration and tips on the blog! Sketch #111 is live over at Creative Scrappers, go check it out! And while you’re there, take note of the Guest DT search we have! You gotta be in to win! 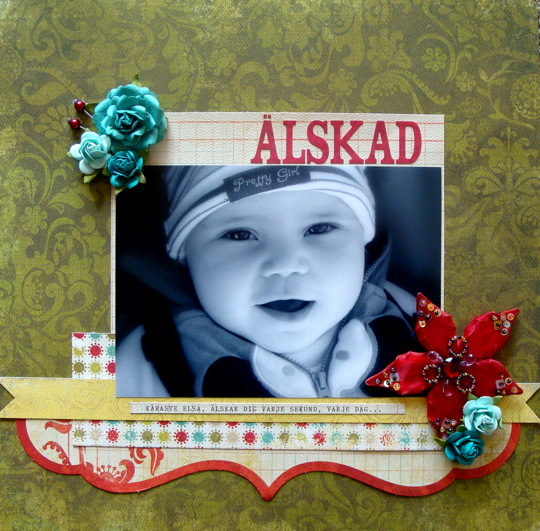 Products used: MME papers & alphas, Prima flowers, Jenni Bowlin pins. Title says “loved”. Then, for the latest sketch challenge over at Scrappin’ Patch, sketch by me this time! 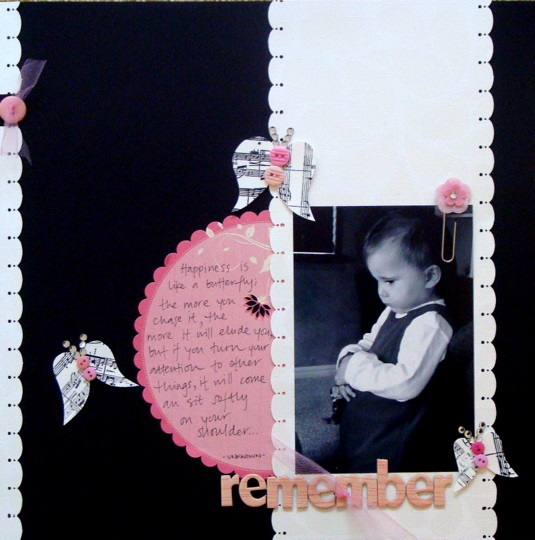 Products used: Cosmo Cricket DeLovely papers & embellies, Martha Stewart butterfly punch, Prima bling. And let me tell you – there is HUGE fun happening on the Scrappin’ Patch forum at the moment! We have an awesome competition with AMAZING prizes, starting Wednesday. Anf there’s still time to sign up if you haven’t already! Products used: Bazzill cs, BoBunny “sun kissed” papers, alphas & embellies. This time using the BoBunny “block party” papers & embellies. 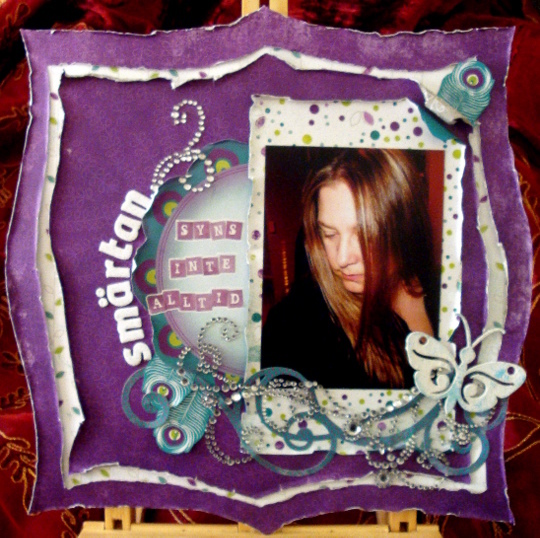 I did this LO for Scrappin’ Patch, showcasing the Tim Holtz distress stickles. I have used the “broken china”. Looooooove it!!! And doesn’t it fit well with the “block party” colours? 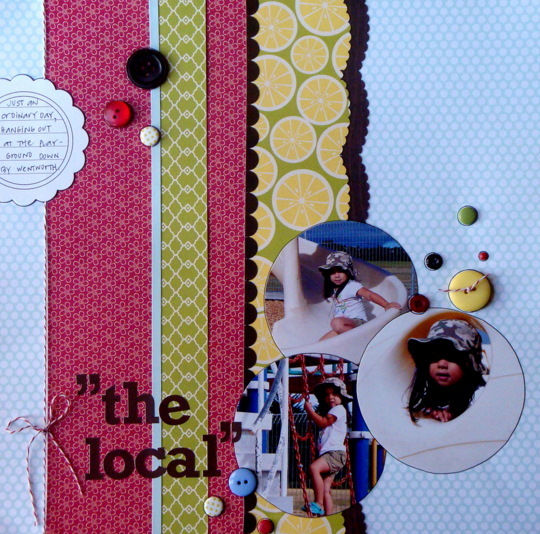 Other products used: Bazzill black cs, Martha Stewart border punch, Prima music stamp & StazOn ink, BG buttons, Kaisercraft bling, Cosmo Cricket alphas, MM journaling thingie & paperclip, misc tulle. 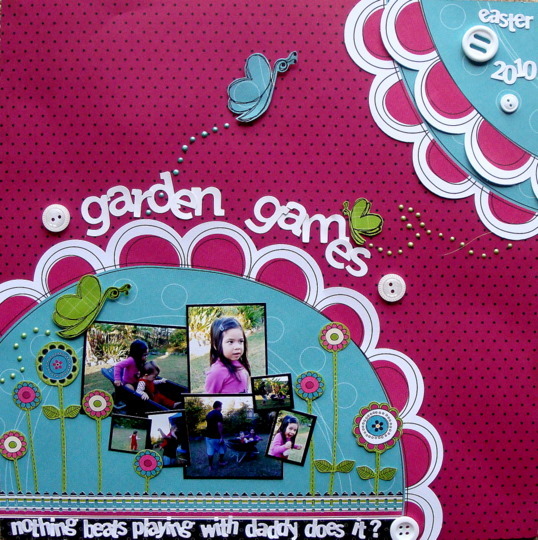 And – before you go – check out the Aussie Scrap Source blog – my “garden games” LO is featured there today! Very, very cool!!! I’ve used the new fabulous Bo Bunny “Petal Pushers” papers, Pink Paislee & BG alphas, misc buttons, Martha Stewart fence punch, Peterlina butterfly stamps, & pearlmaker. As always, there’s an awesome prize up for grabs, so come on – play along! …we travelled some, me and hubby. We love an adventure, but having a family makes it harder to travel. But – having kids sure is an adventure, isn’t it? 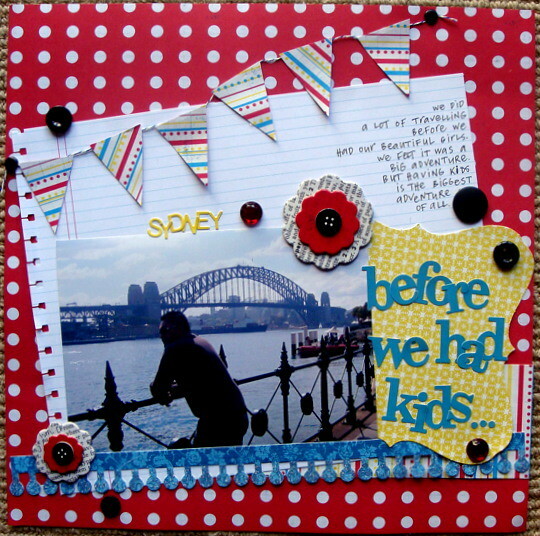 This LO is for today’s challenge over at SWE Scrapbook blog – more bright colours! I’ve got more stuff to share, but my laptop doesn’t want to play with me. So – see ya soon again! 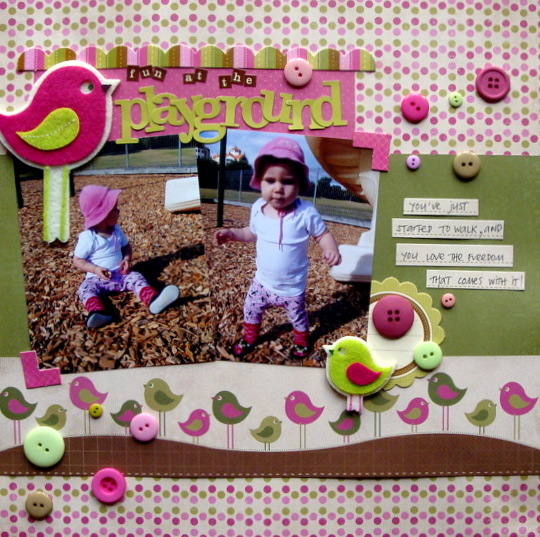 Products used: Lily Bee pp’s & embellies, GCD border, Webster’s & BG alphas, misc buttons & bling, baker’s twine.